Sauerkraut or pickled cucumbers prepared in this 5 Liter stoneware pot are indispensable sources of vitamins. Vegetables stored in airtight crock pots such as the ME2105 5 Liter Crock pot have proven to be one of the best possible ways to maintain the vegetables flavor and fresh aroma. Contrary to foods pasteurized in preserve jars, food items stored in stoneware containers lose none of their nutritional value. The Pot is the best fermentation pot I have owned yet! Also, the service was fantastic! A wonderful investment in your health! We use this pot to make sauerkraut. We have made several batches, and each has turned out perfectly. 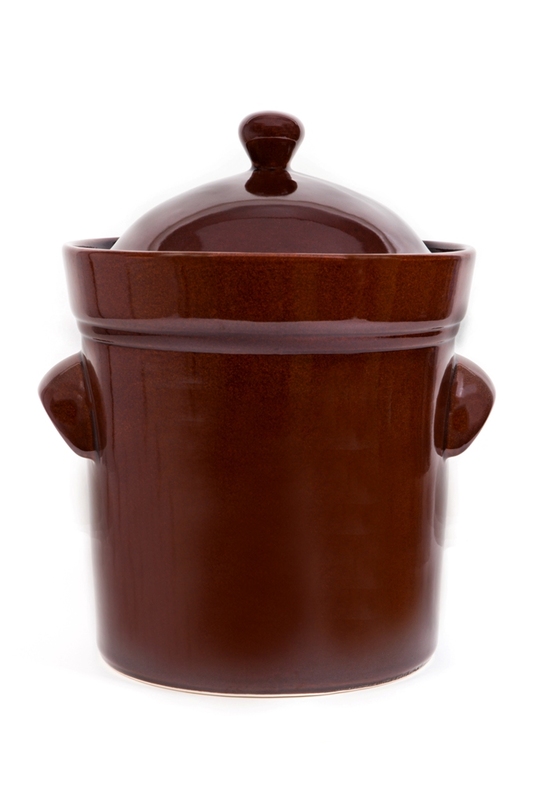 Read up on the many benefits of consuming food, and buy yourself this pot! I'm planning to buy a second when they are in stock again. Not only does my family love the taste of the finished products, I credit the sauerkraut with clearing up my teenage son's acne, something that all the creams and ointments and astringents failed to do. The crock is well made, nice looking, and I\'m sure it will yield great results. I just made my first batch of sour kraut in it. My only complaint is that the opening of the crock seems quite small compared to the size of the stones. I had to have the crock filled to 2/3\'s of capacity in order to insert the stones. It would helped greatly if the mouth of the crock were slightly larger. This fermenting crock is absolutely wonderful, I only have one complaint, and that is my fault; I should have ordered the next size up, I really should have gotten a bigger crock. Oh Well, I'll be ordering another one soon and it will be the larger crock. Anyone who wants to ferment needs to order from Harvest Essentials. Very fast delivery, everything packed to perfection and wonderful products. I would give this 10 stars, but 5 stars are all that is available for me to rank with. Thank you for a great product. The price was a little higher then some other places , but the shipping was fast and it was double boxed. I have a batch of kraut fermenting now , almost 2 wks. I'll give it a try soon and see if it should go a little longer. My sister said fermenting kraut in the house will smell up the house, I told her with this kind of crock, it shouldn't. I was right, if I keep the lid on with water around it there is no smell ! Absolutely more than I really could have imagined. 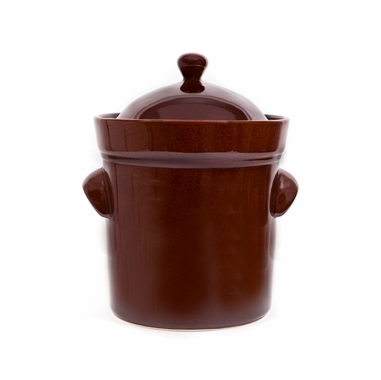 This fermenting pot takes my desire to ferment vegetables to a higher level. This is the only way to go if you are in the fermenting mood, don't waste your time with fruit jars and air locks and.or placing large vegetable leaves over the top of the vegetables to keep the liquid above the fermenting product. This is by far the best way to go and this company (Harvest Essentials is great) My product arrived much faster than I even anticipated it to arrive. A great company with whom to do business, and I will definitely use their service and products again. I use this fermenting crock pot for making sauerkraut. Easy to use and makes delicious kraut. Much more economical than buying readymade in the grocery store.